Psypoke - View topic - What is the pokemon, that you can't play a game without? What is the pokemon, that you can't play a game without? Re: What is the pokemon, that you can't play a game without? I can't go without those HM Slaves. But as for the main team, I normally try mixing it up all the time but there are some I end up using more than others such as the starter, Crobat, Jolteon, Gallade, Excadrill ect. Well since this topic seems to be revived, if I had to choose one pokemon that I must have on my team it would be Gyarados. They are easy to get and incredibly useful early game and late. I have had one in every generation. I love that shiny gyarados was a big deal in Gen 2 and Gen 4 (intro). Also I used a Gyarados on my first gen 1 team for battles with friends and my gen 4 competitive team as my lead. It was pretty effective for a while too! I always try to get myself a Tyranitar ever since Generation II in Gold version. It has become one of my favorite Pokemon. I choose Pokemon Y over X also is because of Larvitar is available in Y only. That's kind of a dilemma for you though because in a lot of games like GSC, FRLG, and Colosseum Tyranitar's line is only available very late in the game. But in XD I think you can get Larvitar a bit earlier and maybe some recent games have been more lenient about that as well. or any other that has Rollout. It's a hand on the wheel. 73% of teenagers would cry if they saw Justin Beiber standing on top of a skyscraper about to jump. If you are the 27% sitting there with popcorn and 3D glasses, screaming "DO A BACKFLIP! ", copy and paste this as your signiature. Hi! It looks like it's been a while since anyone has posted here. I really love the question, so here's my answer, if it wasn't obvious. I vaguely remember the first time I ever caught a Ralts in Sapphire. All it could do was growl, and I was like, "Huh?" But then, I read its Pokedex entry, and I felt an emotional connection with the idea of such a Pokemon -- a Psychic type whose primary communication is emotion. I observed how it became stronger as Kirlia, and then I met Gardevoir, who has since been my favorite of any generation. In any game where I can find Gardevoir, I usually evolve one as soon as possible, and it becomes quite useful as a Special Sweeper. Initially, I thought the Synchronize ability was really great, but then I got a Gardevoir with Trace, and so many possibilities appeared that I had a lot of fun planning spontaneous strategies based on whichever opponents I had. 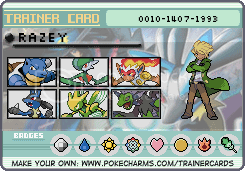 Gardevoir quickly surpassed my starter Pokemon and I was able to eventually defeat the Elite Four with minimal assistance from Pokemon other than Gardevoir. With the introduction of the Fairy type in X and Y, the very first thing I wanted to find out was how Gardevoir had changed, and I was very impressed with the battle enhancements as well as the additional challenge of watching out for Poison and Steel. Then, I noticed Mega Gardevoir. My main concern with the Mega Evolution is that I don't know how to make the best use of the Pixilate ability. I could use the Return technique and have it become Fairy type, but Return does physical damage, which isn't the best. Even so, Gardevoir is still my favorite; I just prefer to give it a different item and stick with Trace when battling. Another favorite Pokemon of mine since X is Florges! All of its evolutions are so very cute and adorable! I raised a Level 8 Flabebe all the way to a level 92 Florges and now it's an amazing battler alongside Gardevoir. I know Florges is a late bloomer (get it? ) 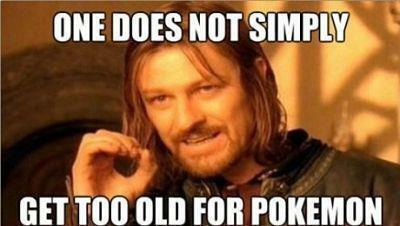 in the generations, but my experience would be quite different without one. Some day, I'll create a team of only purple Pokemon , and try to beat the Elite Four. I wonder if that's possible? I always want the purple ones.